Simple: “Put the shower curtain INSIDE the tub" is about as simple as a message it gets. Unexpected: Although Hilton was founder of a hotel chain, the TV audience was probably expecting something far more profound (and perhaps less self-serving). Concrete: Putting the curtain inside the tub is a very tangible message. Credible: Hilton was credible because he built a huge hotel chain, partly by applying simple ideas like this one persistently, and at the time, Johnny Carson was host of one the highest-rated TV talk show hosts. Emotional. This story is, at least to me, pretty funny, and in some version I’ve heard, people talk about Johnny Carson and he audience just cracking-up. Story. One of the main points of the Heath’s book is that a message packaged in a good story is more memorable, more likely to be passed from one person to others, and more likely to affect action. Indeed, when I put the curtain inside the tub, I hear the entire story in my head, and although I never actually saw the show, I still see Conrad Hilton telling the story and Johnny Carson laughing his trademark laugh in my mind’s eye. The ideas in Made to Stick aren’t just useful for analyzing past stories, Chip and Dan use these six SUCCES (one "S" shy of the word "success") principles to teach executives and students how to best craft new messages and stories too. In fact, Just a few weeks weeks ago I watched Chip do a masterful job of leading an exercise with Stanford d.school students, helping them craft messages about spreading the use of compact fluorescent light bulbs, which use far less energy than conventional bulbs. BUT the second step – which too many researchers and policy-makers miss – is that you need to craft valid messages and stories in ways that will stick and spread. Unfortunately, having a better idea isn’t enough; good ideas don’t stick without a great salespeople to spread craft and spread the news. For example, Steve Jobs and Thomas Edison would not have become among the most famous innovators in American history on the basis of technology ability alone: It is no accident that they are two of the most compelling storytellers and salespeople in business history. The power of “sticky stories” creates a major challenge for managers, consultants, and researchers who want to spread evidence-based practices, and stop the spread of nonsense and half-truths. Those ideas that spread and stick aren’t necessarily the best, but instead, those sold by the best stories and story tellers – a troubling implication of the Heath brothers’ brilliant book. 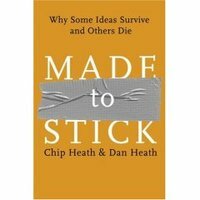 I was VERY surprised that "Made to Stick" was overlooked as a 2007 Quill Nominee. Especially given it;s cross-over appeal and universal teachings to non-business readers. He said it on the Ed Sullivan show, not Johnny Carson. At least I remember reading that in his autobiography. Which I found when I stayed in a Hilton years ago. Much more interesting than the Gideon.